Mobile video conferencing is becoming more like the music industry every day: Everything is getting free, fast. 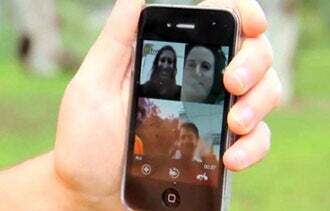 Israel-based fring, which launched its four-way video calling service in April, enables decent-quality, multiperson video chats over iPhones and Androids. For in-fring network calls--assuming users have downloaded and enabled the app--video calling is free. Out-of-network calls ring in at pennies per minute (a call to the U.S. from a mobile phone in Greece, for example, costs 7.2 cents per user, per minute). Not bad. Overall, call quality is acceptable for a free app. But what is most impressive about fring's service is the group video calling: Up to four callers can chat--and see each other--in real time. "We see that businesses are thrilled with the consumer innovation we are bringing," says Jake Levant, vice president of marketing at fring. "So it seems that consumer innovation has a big resonance with small and medium enterprises too." Fring has its issues. For starters, users must be certain they are on an all-you-can-eat Wi-Fi connection. One can easily burn through a capped data plan otherwise. And pricey international roaming charges could be lethal with this tool. Video collaboration is basic at best. And uneven network quality can degrade conference quality. But for staying in touch with your people or holding an ad-hoc meeting, fring is worth a try. When it works, it is an effective, inexpensive way for a group to stay in touch on the road.